UK-based Bakkavor Meals Sutton Bridge has selected Faerch Plast’s perforated two-compartment trays for the re-launch of Tesco’s Indian Kitchen Meal for One range. Accompanied by pilau rice, the seven meals within the range include chicken tikka, chicken jalfrezi, chicken korma, lamb rogan josh, prawn tikka masala, butter chicken and chicken vindaloo. For Tesco’s Indian Kitchen Meal for One range, Bakkavor and Denmark based packaging solutions manufacturer Faerch Plast worked closely to develop a black CPET two-compartment tray for an easy-snap process. Bakkavor Meals Sutton Bridge senior process technologist Nikitta Halifax said that the firm, until recently, used a standard compartmented Faerch Plast’s CPET tray for the Tesco Indian Meal for One range. Halifax noted that Faerch Plast designed a robust pack following several samples and trials. The pack is also designed to remain intact during transit and throughout highly automated production process, including de-nesting, filling, sealing and sleeving functions. 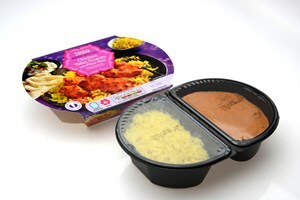 Faerch Plast said that Bakkavor Meals Sutton Bridge is using its new four-compartment CPET tray for another range of Tesco Indian ready meals comprising a main dish, pilau rice, Bombay potato and onion bhaji. Halifax added: “As well as new tooling and tray design, we installed the latest high speed, high volume denesting equipment. Designed to offer dual-ovenability and a temperature tolerance from –40°C to +220°C, the Faerch Plast’s CPET trays can eliminate negative effects on food flavor and aroma. Image: Faerch Plast’s black CPET two-compartment tray. Photo: courtesy of Færch Plast A/S.